1 What is the Muse Meditation Headband? When you were a kid, did you have a favourite superhero? I did. My favourite character was, and still is, Wolverine. There’s both an obvious reason for this, and a more subtle one. The obvious one is his anger. Anger is one of the most suppressed emotions in modern society, and young men often don’t have an outlet for it. That’s why they’re drawn to violence in the forms of video games, movies, and certain types of music. There’s another superhero who’s been incredibly popular in recent years. His movies have grossed over a billion dollars. Because people can relate to him, they want to be him. Iron Man’s draw is that people see themselves in him. It’s technology that gives him his strength, despite his obvious character flaws; abrasiveness, stubbornness, alcoholism. And in a modern world fascinated by technology, that’s relatable. But how close could we really come to being like Iron Man? Could we fly? Could we have superhuman strength? How far could our physiological advancements go? And if we consider this question within the context of the mind and meditation. How could technology supercharge our minds? To what degree and in what way could it improve our experience with meditation practices? Advocates of neurotechnology will likely say that meditation was developed without modern scientific rigour. They’ll argue that the efficacy of practices would make leaps and bounds if they were assisted by technology and underwent longitudinal studies and double-blind trials. Meditation purists will argue that there is no place for technology in practice. That the best case scenario is that it is distracting and encourages laziness, and worst case is that it is damaging to the practice and the traditions themselves. I’ve been considering this question for a while. I believe myself to be a secular and scientifically minded meditator. However, I also have a deep heartfelt appreciation for the cultural aspects of meditation and am a believer in the power of bhakti (devotional) practices. So to delve a bit deeper into this question I thought I would do something practical as opposed to theoretical, and I purchased the Muse Meditation Headband. 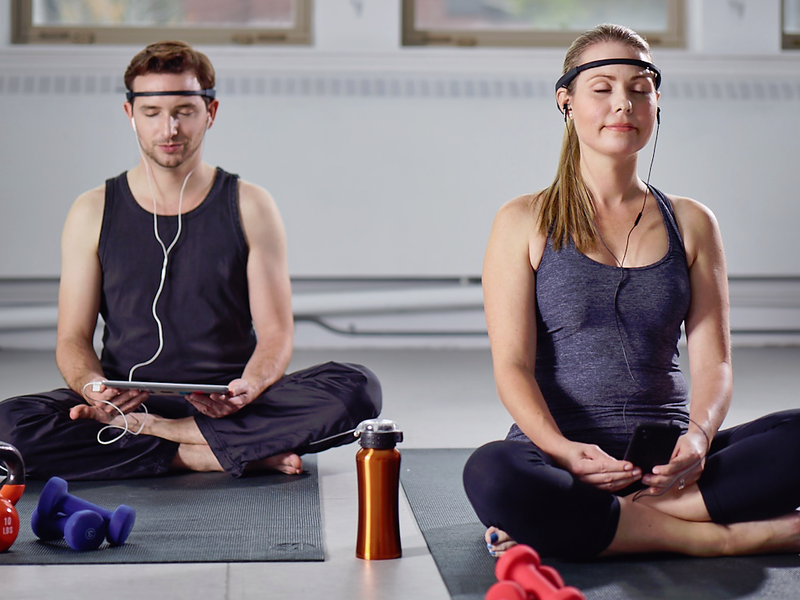 For its price point, the best available consumer-tech when it comes to meditation. 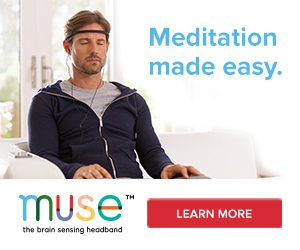 What is the Muse Meditation Headband? The Muse Brain-Sensing Headband is a neurofeedback device that works on EEG technology. The slick band is adjustable and fits comfortably around your head, with two sensors resting against your ears. After the first session, I didn’t even notice that the band was there. Developed by a Toronto based tech company called InteraXon, the portable device has been around since 2012 after having been crowdfunded on IndieGoGo. 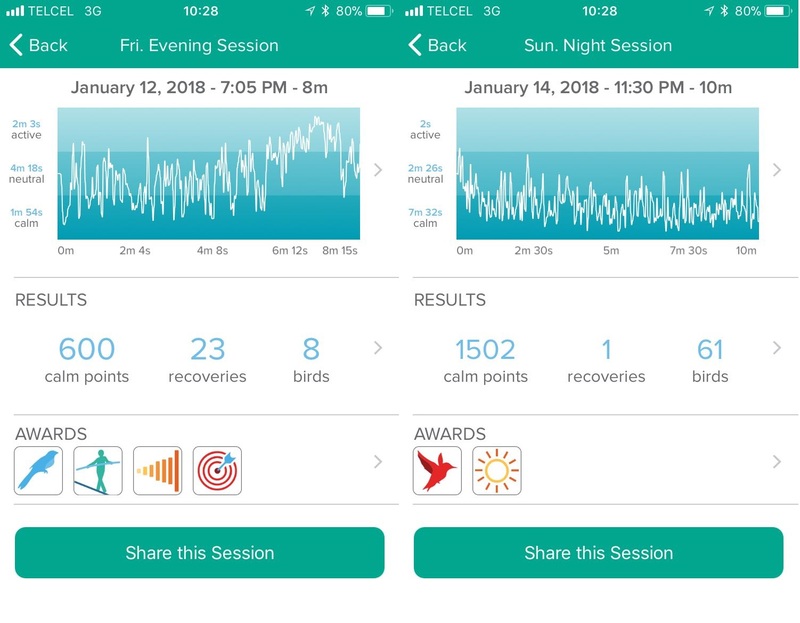 There is an accompanying app for the Muse, available for iOS and Android, which tracks your sessions and gives you live audio feedback depending on how your mind is going. There are five tracks to choose from for your meditation sessions: rainforest, beach, desert, ambient music, and city park, and you can decide how short or long you would like it to be. The feedback categorises your mind into three states: active (the wandering mind), neutral (a resting state), and calm (a deep restful focus). I found that in the calm state thoughts still arose, but they were much more subtle than in the other two. What the Muse app does that is very interesting is that it gamifies the process. So for every second you are in the calm state you receive 3 points. When you spend significant time in the calm period, birds will chirp, which is designed to condition your mind to know when it is in a calm state. 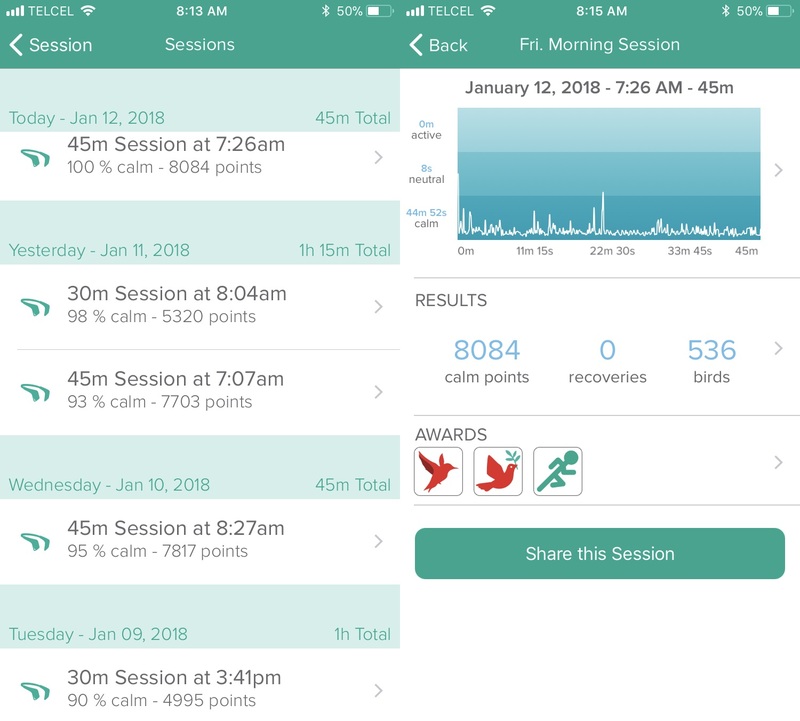 Digital awards are also then given depending on time and percentage spent in calm, as well as number of points/birds and the length of sessions. It’s important to notice that the EEG feedback is consumer-grade and not laboratory-grade. The Muse has been designed for Focused-Attention Meditation, which means other practices sometimes invoke what the device considers neutral or active states. My experience suggests that the second version of the Muse has fixed early issues some customers had; the device now allows you to meditate as long as you want, the battery life lasted me at least ten hours, and I had no issues with the connection dropping out. We know that meditation has been validated by science, but to what extent has the Muse itself been used in empirical studies? Well, it turns out quite a bit. However, if you’re (very) sceptically minded I would recommend doing your own research into what degree InteraXon and affiliates funded *cough* these studies. To be fair, it looks like some high profile researchers at institutions such as MIT, Harvard, and the University of Toronto, have used the Muse in their research. You can see some of the scientific papers via the Muse website here – it does seem that at the very least Muse is as effective as traditional mindfulness training. I’m generally sceptical of research claims, particularly with something as broad and complex as meditation. However, I said that to also say that I don’t think you need to wait for research to see the benefits of practice. In the case of meditation, it’s much more useful to follow anecdotal evidence – which is the point of this article. If the Buddhists had waited for Harvard to validate their methods before starting a practice, they would’ve been waiting 2,500 years! To test out the efficacy of the Muse on a beginner meditator I used my dad. I thought he was a good test subject for a number of reasons. All in all he fits the demographic for someone who is likely to purchase the product. Before the first session, he was given basic instructions to practice mindfulness of the breath. After the Friday Evening session (23% calm) he said that he felt mind was wandering and he still didn’t really get what he was supposed to be doing. Following the second session, I told him to go through a meditation ritual and try to let go of the idea of meditating and allow the sounds of the app to guide him. After Saturday (63%) and Sunday (75% calm) meditations, he reported feeling “a lot more calm” and that he “was starting to understand where he was supposed to take his mind.” He later remarked that a few sessions with the Muse had been more helpful than the 4-weekend mindfulness course he’d taken a couple of years back (which cost around $400). Though I would always recommend going with a teacher, these kinds of courses often don’t have the time to offer personalised feedback to students in such a short period of time. 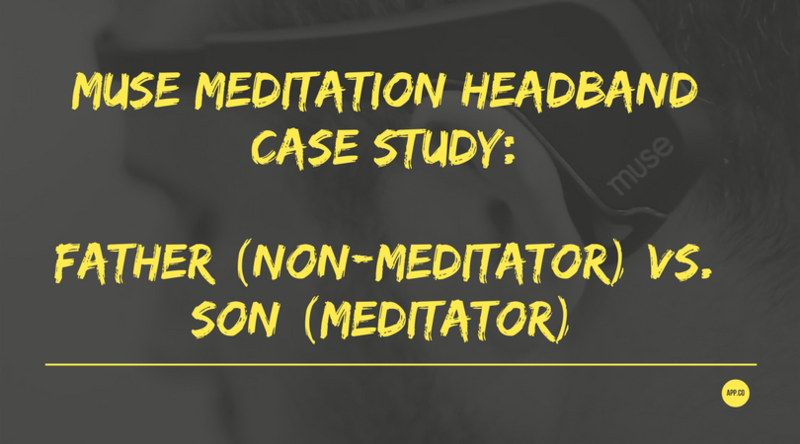 From the data of 5 sessions, we were also able to determine what hours he was most effective, as well as a couple of subtle personal and professional stressors had a negative impact on his meditations. I consider myself an intermediate meditator. I would say over the last three years I have done somewhere roughly between 750 and 850 hours of meditation – with the majority of that (say 70%) in the last 18 months. On average about 45 minutes a day, some days a couple of hours, some days half an hour. And it seems that all those hours have definitely paid off. There was an obvious difference between my sessions of the intermediate and beginner. Both in duration and length of calm. The 75% achieved by a beginner I believe is quite high. I think that the Muse can cut down a lot of the early stages of confusing around meditation and get over the feeling of being in the dark around your practice. There is a huge (dare I say life-changing) difference that can occur in just a few years of consistent meditation practice. My best session with 100% calm didn’t feel as deep as my second best session with 98% calm. The spike in the middle of the Friday morning session was when my neighbour started playing the violin. I found that doing my own practices as opposed to following the instructions was much more effective. I was able to go deepest when practicing self-inquiry and nondual meditations – however, because these techniques are subtle, it’s easy to slip into the thinking-mind which would sometimes spike me into neutral. Any practice that required visualisation – I used a Sufi heart meditation and a Buddhist Metta practice – would be more active. Though this could be because I less have experience with these techniques. So would I recommend the Muse? Well that depends on where you are with your practice and what you want out of it. I would 100% recommend the Muse for beginner meditators – I really wish I had one when I started. I would say it’s common for almost everyone who is just starting (and even occasionally after a hundred hours) to have the question “am I doing this right?” – in this case, tangible feedback is absolutely invaluable. In the beginning, meditation is confusing and it can feel a little like a waste of money and potentially that you’re floundering around in the dark. The Muse gives you immediate results that are both practical and motivating, which is vital when starting to build the habit of meditation. It will also teach you to let go of attachments to the result of each sitting. As a side note, for beginners, building the habit of meditation is infinitely more valuable than having ‘deep’ meditation sessions. If you have the money to spend, go for it. I’m always one to advocate investing in meditation products, whether that’s books, courses or retreats. If you’re diligent with your efforts, the money spent will reveal itself to be one of the best decisions you ever make. A lot of new meditators can’t tell the difference in the feeling between different states of Mind. They may experience sleepiness, hypnosis, mind wandering and meditation and assume they are all the same. Because sleepiness and hypnosis, and even certain types of mind wandering, are calming, they may be mistaken for meditation and real change may not be taking place in your brain. I suspect that this is the case for A LOT of practitioners who don’t have an experienced formal teacher to guide them. For someone who has a few years of consistent meditation under their belt, I would still recommend the Muse – but only if you’ve got some cash lying around. It won’t revolutionise your practice, but it did give me some subtle insights into the different mind states. I would say that it’s given me a little more clarify on when I’m ‘feeling’ and when I’m ‘thinking’. I think the app was also pretty effective in showing me how to transfer a state of calm that I can bring to my daily activities. The sessions with the Muse also got me into the flow state a lot quicker and tend to feel about 30% shorter, i.e. 30 minutes feels like 20 and an hour like 40. However, one of the downsides was that, for more advanced techniques, the Muse doesn’t allow for a creative approach. Anything to do with self-inquiry (though I did this), exploring emotions or letting go of attachments isn’t really appropriate for the Muse. I would also say that for me personally it brought up a competitive feeling (very un-meditative I know) but this was something I needed to let go of a few times all the same, and is always a useful lesson. I would suspect that after a few sessions with the Muse, Advanced Meditators would score consistently between 98% and 100%. A more nuanced (and expensive) technology would be necessary for advancement meditators to gauge any significant feedback. It could still be fun to play around with, but I don’t imagine it provides much practical help. The Muse is incredibly affordable compared to other devices of a similar comfort and quality, such as the Versus Headset ($799). You can get the Muse at choosemuse.com for $249USD. I’m an affiliate for Muse which means I get 15% of the purchase price when you visit their website through this link. Do you have any questions about the Muse? What do you think about using technology to enhance meditation? Let me know in the comments; I’d love to hear from you! Very interesting rundown, and especially interesting and appreciated that you thought it through for beginners, intermediate and advanced. Sounds promising for all, and I wonder if this wouldn’t help people also develop more discipline with their digital devices. Since they’re tethered to the same thing responsible for mindlessness, I can see this helping people craft better online and digital exposure practices almost without meaning to do so. Interestingly enough the same technology is being used in glasses in order to prevent mind-wandering on the job – they’re called the lowdown focus and are sold by Muse as well. Difficult to know how well it actually works, but I wouldn’t be surprised if something like this emerged with AR glasses in the relatively near future. If it could be shown to improve employee productivity, I’m sure companies would adopt it immediately. The downside of that would be if they took it as far as measuring your performance based on mind-wandering, imagine that!